The first RootsTech I attended took place at the beginning of a major transition in my genealogical life, from part-time hobbyist to full-time professional. After more than a decade working in technology for digital media companies in New York City, I arrived at the conference with the itch to figure out how to combine my professional talents with my lifelong love for family history. Part of the urge came from my own inability to find the software to share my family tree in a way my family would connect to. 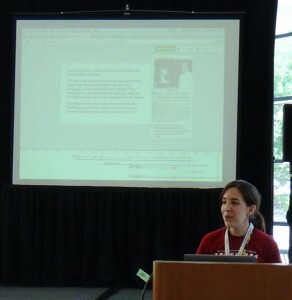 The previous year I had written the software for my own family tree website, but I continued to hunt for that elusive product that presented family trees story-first and came to RootsTech 2012 with that goal in mind. Where better to find the best-of-the-best than the conference that attracts the most technologically innovative companies and individuals in the genealogy space? And indeed, the vendor hall blew my mind. It was like walking through a candy land. But I didn’t find what I was looking for. When I wasn’t gaping at all the exhibitors, I attended a number of sessions. I had high hopes for one in particular about technology for sharing family stories, but the speaker didn’t present anything I hadn’t already discovered in my own investigations. What did make a lasting impression on me, however, was that of all the sessions I attended, that one was by far the largest. The room was filled standing-room-only with people as desperate as I for a better way to share family stories — and it suddenly dawned on me that the reason why I didn’t find one in the vendor hall or in this session was because there wasn’t one — yet! I stayed up all night in my hotel room organizing all of the ideas racing through my mind. “EverythingWeKnowAbout.us: Curatable, shareable, multimedia presentations about your favorite family stories,” read the title page of the nineteen-slide Powerpoint I sent to friends and family before I collapsed in exhaustion. Their response was positive, so I quit my job two-and-a-half months later to make it happen! 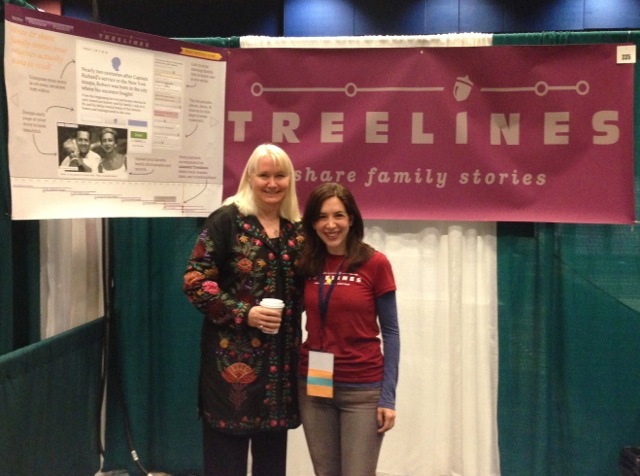 I decided pretty quickly that I wanted to launch Treelines at the next RootsTech, and so I did — one of the proudest times of my life. The best moment was when Treelines was announced in front of everyone as the winner of the Developer Challenge, but the whole conference was a three-day high. I loved meeting so many of the conference participants, not only to see the excitement on their faces when I showed them what Treelines could do, but also when I learned from them what else Treelines should do to serve their families better. 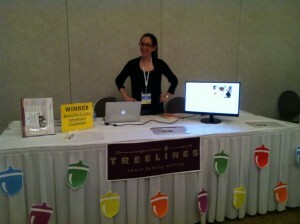 Launching at RootTech and especially winning the Developer Challenge were a great way to jump-start Treelines. I knew there were a lot of people in attendance, but I hadn’t realized just how many more people were watching from home, and many of them are amongst Treelines’ earliest users, too. And I also hadn’t expected how many of the top influencers in the industry were paying attention and as a result helped me publicize Treelines. I remain so grateful to RootsTech for making it possible for an individual like me to introduce something new to a large, motivated audience. 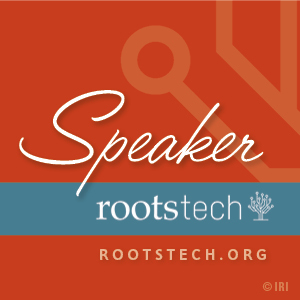 If, as I was, you are looking for a way to professionalize your genealogy activities — or just increase your profile in the community — RootsTech is the perfect place to find your niche and get your name out there. And if you’re a fellow software developer, I absolutely recommend sharing your efforts through the Developer Challenge — I can think of no better way to have launched Treelines. I’m proud to say that this year will be my third time attending RootsTech, my second as a speaker, and Treelines’ second as an exhibitor. As the date draws near I’m starting to feel the same excitement I had two years ago before my first RootsTech — to see all the cool, new products on the vendor floor, learn from my fellow speakers, and get to know more genealogists. I’ve never left RootsTech without my head exploding with ideas — not just for new genealogy software I could build, but also for new and better ways to research and share my family history. 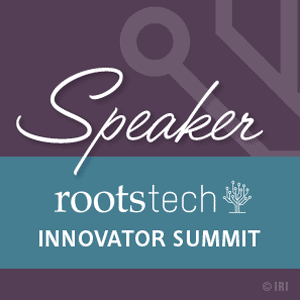 I wonder what inspiration I will leave RootsTech with this year… can’t wait to find out! Or come to one of my classes! Have you checked out the new Treelines homepage? If so, hopefully you’ve noticed we’ve moved your family groups and your family’s stories front-and-center to make it easier than ever for you to work together with your family! From the moment you return to Treelines, with just one click you can view your family’s latest stories, work on your own, and invite your family to help you out. We hope all of these changes make it even easier and more fun for you & your family to work together on assembling your family’s history! 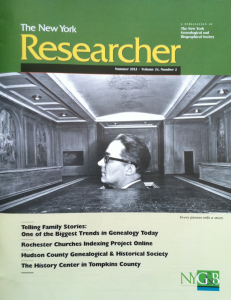 When the New York Genealogical & Biographical Society, the most authoritative source for research on New York families and families with New York connections, wanted to tell its members about the emerging focus on family storytelling within genealogy, they asked me to write the cover story for their most recent issue of their magazine, The New York Researcher. With their permission, my article is reprinted below. The printed version also included a nice call-out about Treelines, for which I am quite grateful. I have enjoyed getting to know this society tremendously and recommend anyone with New York roots to check out their offerings. What do physics and genealogy have in common? Besides a preoccupation with certainty, in my family they’re a sure way to get most of the dinner table to tune out the conversation. The physics chatter is nearly always the fault of my father, but talk of genealogy – or “dead people,” as my mother dismisses it – comes from mostly from me, and it is equally unwelcome. I know I’m not the only one whose family thinks she’s nuts for her obsession with “dead people.” Part of the problem was of my own making: the more I got into genealogy, the less I talked like a “normal” person, and the more I spoke with the jargon of a specialist. I presented elaborate trees and historical records and expected my family not only to understand what I was showing them, but also to share my excitement for what they depicted. Have you made this mistake, too, talking and writing like a genealogist to non-genealogists? How often do people presenting you with charts about arcane subjects capture your attention? And yet we persist in making the tree the centerpiece of how we share our work. The tree organizes our family history, but it doesn’t make meaning. It’s the stories that do. In the context of family history, the story is the interweaving of genealogical evidence and interpretation, historical context and creative extrapolation. It takes us beyond our role as researchers looking for the who-what-where-when and demands answers to the why and how questions that make sense of the real lives these real people led. Yes, it might cross a line from certainty to speculation, but the more we can put the flesh on the bones of our ancestors, the more we can make our work relevant to family members who are looking for a personal connection to the past. Tell them a story about an ancestor whose life they can relate to, and you’ll find suddenly they’ll start engaging with you about their family legacy. And what is the worth of all our efforts if we can’t pass them along? That’s the central point of this story-oriented approach. It isn’t about changing the way we research or replacing the traditional research process. It’s about changing how we communicate about our findings. What it comes down to is finding ways to reveal the vibrant people behind the dry records they leave behind. We know how to look at evidence to draw conclusions and pose new questions. But to do our research – not to mention our ancestors – justice, we need to move beyond the bare facts of a person’s life into the fullness of their life journey. Curating the piles of research we accumulate, not to mention reading between and around this evidence for the narrative glue, is its own skill. The results may not be appropriate for an academic journal, but that’s not the point. It’s about the most human of impulses – putting yourself in the shoes of your ancestor to imagine their world and how they experienced the important events of their lives. The first time I worked this way was when I was researching my maternal grandmother’s mother, Fanny Skversky. Matching the tree my grandmother dictated to me with the surprising number of available records was a satisfying process for me, but needless to say, my family’s eyes glazed over at the resulting trove of documents and charts. The only reason why I made the story breakthrough at all was that I became obsessed with the unusual chronology of Fanny’s immigration from Russia. She, her mother, and five siblings arrived together in Liverpool in early August 1905. Mid-August mother and siblings departed, leaving Fanny behind for three and a half months until she sailed in late November. 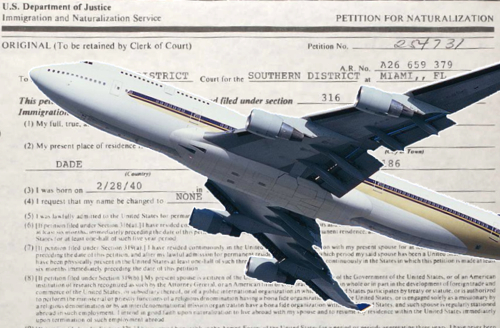 Why was a fifteen year-old girl left alone in a foreign country? I just could not let go of the mystery implicit in the ship manifests. I started asking different questions of the records – not just those that might lead to discovery, but also those that gave me broader context – and found answers in histories about the wave of Russian-Jewish immigrants who came to South Philadelphia in the early 1900s. Eventually a granddaughter of one of Fanny’s sisters told me that she had heard that her grandmother fell ill and was not allowed to accompany the rest of the family to Philadelphia. Wrong ancestor, but mystery solved! When I returned to my family after this second round of work, I had something very different to share: a story. It had a setting – all that I had learned about turn-of-the-century life in the Pale of Settlement and the Jewish Quarter of Philadelphia. It had characters – perhaps not the actual people my ancestors were, but composite sketches from their community. It had a plot, which began with the pogroms (anti-Semitic mob attacks) they fled, heightened drama with the three-and-a-half year separation of Fanny’s father while he worked in Philadelphia to afford to bring his family over, the climactic separation of Fanny from her family in Liverpool, and the happy conclusion when she made the crossing just before winter set in. Fanny’s ship manifest noted that her mother met her at the dock. “Mother called”: now I had my whole family imagining all the heartbreak and relief captured in those two simple words written over a century ago. Even my sister, once the most genealogically disaffected of everyone, admitted I had her hooked. She pointed out that as a child she had enjoyed reading historical fiction of this sort. Finally I had made our family history as engaging as those stories – with the added empathy of explaining her own family, and thus herself. In this way she is not an anomaly. 84% of American adults say they have an interest in their family history, but only about 1% are doing what we would categorize as genealogy. The rest are reading historical fiction, looking at old family photographs, telling stories around the dinner table, visiting museums, and watching historical movies. Our family is not as disinterested as we assume. As humans we have a primitive need to make sense of the world – most fundamentally, where we came from and why we are who we are. That’s why my father spends all his time reading physics books. And while I don’t know how to make my family care about what happened in the fractional seconds after the Big Bang, I do know that if I put as much effort into how I pass along my genealogical discoveries as I do in making them, I can connect to their latent interest. Day in, day out, sharing and listening to stories is what we do as humans, and we genealogists are uncovering some of the most personally affecting stories our families might ever hear. It’s up to us to carry our work across the divide and meet them where they are. Many of us genealogists focus on rediscovering how our ancestors left their homelands decades or centuries ago. But immigration is not an experience confined to the past. This week we’re kicking off a project to collect stories by recent immigrants and their children. 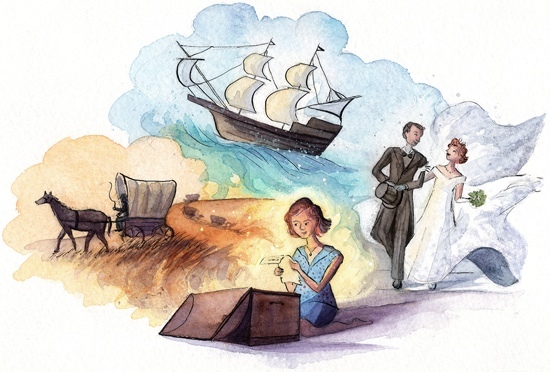 From these stories we can infer the emotions and transitions our ancestors went through. If you are first generation in your country, there’s no more important story you can record for your family to help them appreciate their identity and opportunities. 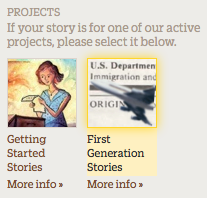 And we’d encourage you to share your story publicly on Treelines to enrich all of our understanding about what it means to be an immigrant — just select the “First Generation Stories” project when you publish your story. Here’s the story of Lev, who was 11 when his family left the Soviet Union without a clear next direction. The #1 most requested feature for Treelines is collaboration. We hear often from folks like the two brothers we met at RootsTech who were just two of eight siblings scattered across the country, each with different family photographs and stories that they all want to put together for posterity. Well, the day has come: Treelines is now a fully collaborative platform! You and your family can start working together on Treelines to build your family tree and tell family stories. 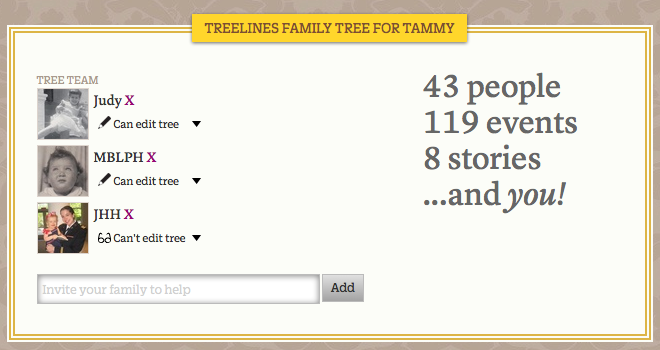 To work with family members on your tree: At the bottom of the “My Stories” page (reachable by clicking on your username at the top-right of any page), you’ll see a list of your trees on Treelines. Click on one of them to get to the new “Tree Team” page. The “Tree Team” page also includes a fully browse-able and editable version of your tree. And best of all, it will display the growing collection of stories you and your relatives share about your family. 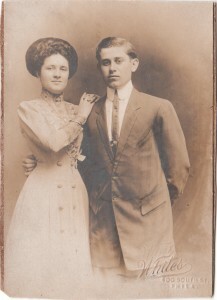 Over time this page should become a real treasure-trove of your collected family history. To work with family members on a story: Go to any one of your stories in progress. In the right column, you’ll see a new link for you to add collaborators to your story. 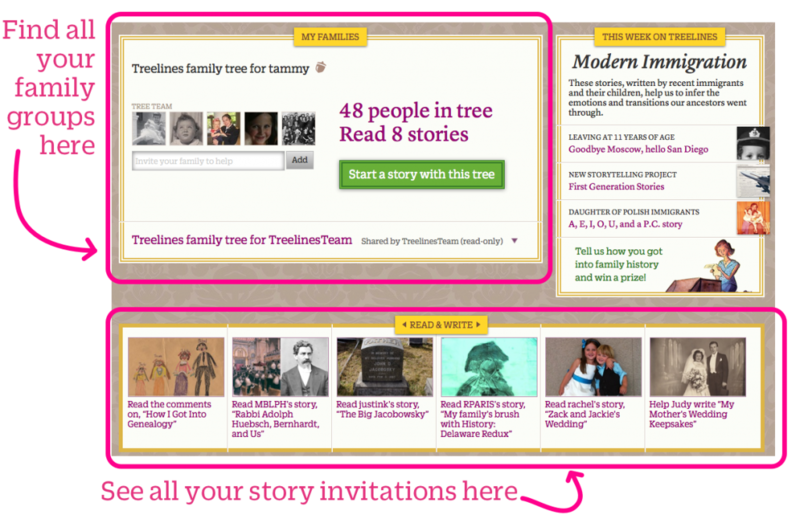 Clicking on this link will bring up the new form for you to invite story members to write family stories with you. Don’t worry — you’re still the only person who can decide when you’re ready to publish your story and whether you want to share it publicly or privately. 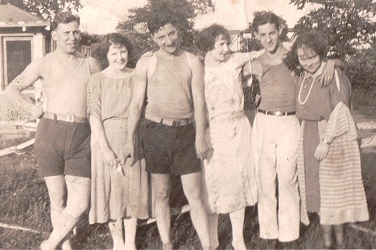 Maybe you have a story you want to write, but your cousins need to add pictures from each of their family albums? Perhaps you and your siblings have unique memories about your grandmother you want to put in one place? Now you can all work together in the Treelines storybuilder. As an example, here’s a story our founder & her father wrote together about a favorite ancestor of theirs — if only they could prove he is an ancestor! We’re really excited about these new features, and we can’t wait to see the amazing ways you and your start working together to preserve the best stories of your family’s history on Treelines. Tammy demo’ing the site… just before announcing the “Getting Started Stories” contest! It was a long trek last week from Treelines headquarters in New York City to the Southern California Genealogical Society Jamboree in LA, but it was more than worth it to connect with some of our current users and make a ton of new friends. We loved hearing about all of your family stories and ways Treelines can help you share them better. Thanks especially to those of you who attended one of Tammy’s two demos! Most exciting of all was finally getting to announce our “Getting Started Stories” contest. We were gratified that so many of you were equally excited to hear about it! We were included in Denise Levenick’s list of people and sites helping to reduce the genealogy generation gap. Thanks also to Eastman’s Online Genealogy Newsletter, Moultrie Creek Gazette, and others for helping to spread the word about our contest! Our next conference won’t be until FGS in August. We’re going to have an even bigger announcement then… stay tuned! Now it’s your turn! However you caught the bug, we at Treelines want to hear the story. Take a break from telling the stories of your ancestors and tell us about yourself and how you started on this amazing genealogical journey! Maureen might examine your mystery photographs! Three winners will each win personal consultations with Maureen! Maureen believes every photo tells a story. She’s discovered how a single photo can unlock a family mystery, break down a research brick wall, or reveal a lost family story. Now’s your chance to find out more about your photos! If you’re new to Treelines, you should read our basic user guide and our family tree guide to get familiar with all the different capabilities of the tool. Make sure your story incorporates lots of pictures and is accompanied by great Treelines with the relevant people and dates from your family tree. 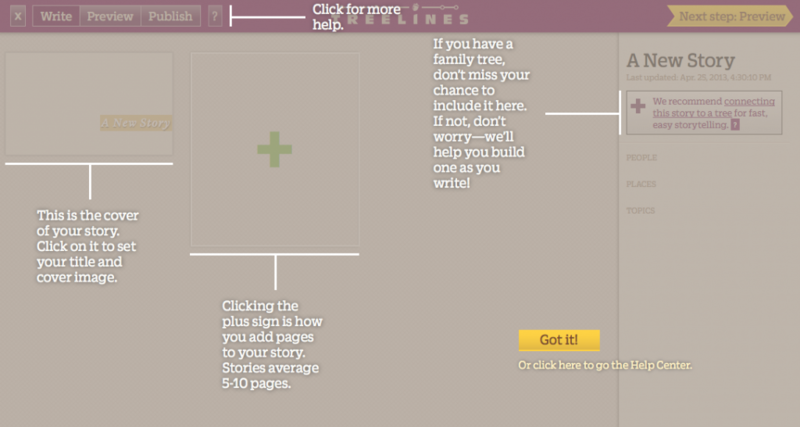 Write your story using the Treelines storybuilder. 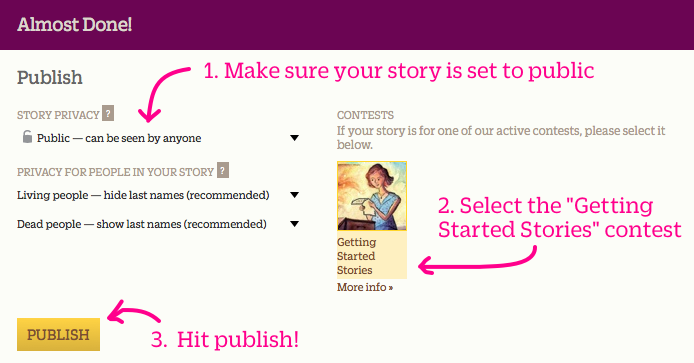 One way to launch the storybuilder is to click the green “Enter now” button on the “Getting Started Stories” page. We can’t wait to read all your fabulous stories! Have fun, and good luck! * Full rules available here. Please contact us with any questions. NGS in Review & We’re #2! 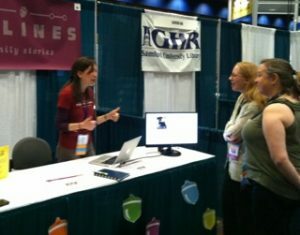 We spent an amazing time exhibiting at the annual National Genealogical Society conference earlier this month in Las Vegas. We met a lot of fabulous people, many of whose family stories we can’t wait to share with you in the coming months (stay tuned!). Extremely exciting to get this attention so early! Thanks, Mashable! 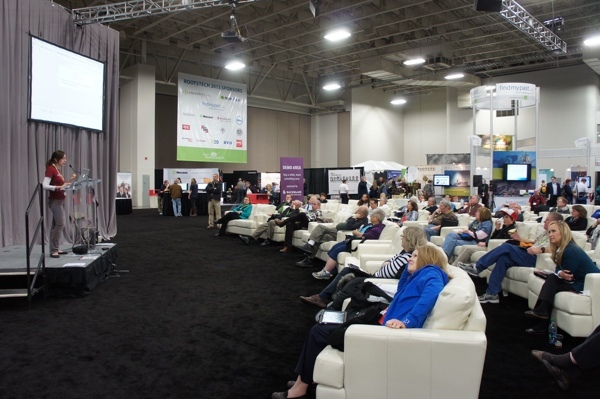 Hard to believe it’s been only a month since our big launch at RootsTech! Last time we wrote, we had just arrived in Chicago to present Treelines at the national conference of the Association of Professional Photo Organizers. It was such fun introducing Treelines to this wonderful group, who help other families organize and preserve their own history. Since returning from APPO we’ve made lots of tweaks to the Treelines storybuilder to make it even easier and more fun to use. 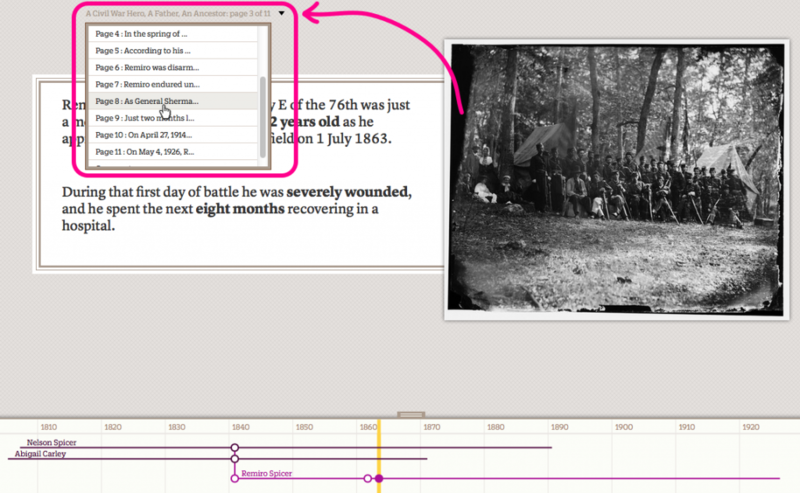 We wanted to draw your attention to one of the bigger ones: contextual help overlays! When you use the storybuilder for the first time, overlays like the one above will appears as you encounter different areas of the storybuilder for the first time. We hope this will make it easier for new users to get the hang of things. To be unobtrusive, each overlay only app ears the first time you encounter something new, but everywhere you see a purple box with a question mark like the one at the left, you can bring back the help tips. Of course, we have a whole help center at your disposal, with tutorials and FAQs, but we think this way is so much easier and faster when you’re already immersed in writing. No idea what we’re talking about? Haven’t yet given Treelines a shot? Sign up for our waiting list to join Treelines today! Greetings from Chicago! “My kind of town, Chicago is / My kind of razzmatazz / And it has all that jazz” (sang Frank Sinatra). We’re here for the national conference of the Association of Professional Photo Organizers, which starts this evening. The APPO folks we’ve met so far are amazing, dedicated, high-energy people, and we can’t wait to show everyone here how Treelines can help their clients tie together their family photographs with the stories that truly bring them to life. Screenshot of the alternate navigation (click to view full-size). And if you haven’t signed up for our waiting list yet, what are you waiting for? We’re letting in new users every day, so claim your place in line!